Emotional Fitness Advice for parents: Stop trying to make your kids happy. Contentment fits better with Emotional Intelligence. The above bit of parenting advice was prompted by this Daily Prompt: Community Service: Your entire community — however you define that; your hometown, your neighborhood, your family, your colleagues — is guaranteed to read your blog tomorrow. Write the post you’d like them all to see. As the first skill I wish all could learn is the capacity to self-sooth, here are three Emotional Fitness Training exercises devoted to creating calm. Here are three self soothing exercises that are easy to learn, take minutes to practice, and in time become almost automatic, providing you practice them as directed . If you do not already use these or similar ones, take time to learn them. When you have mastered them, teach them to your child. Tip one: The One Minute Meditation. Take a slow deep breath in, Hold until you feel tense, slowly breathe out; when breathing in for your next breath say “Thank” and smile gently. That is what EFTI calls a Calming Breath. Keep breathing but normally; observe,and count your breaths. When you have counted ten breaths, take another Calming Breath and go on with your life. Tip two: Sloganeering calms negative self talk. Calming slogans need to be short and contain only positive words. Examples: “Staying strong,” “Moving on,” “Doing my best,” or “Kindness helps.” When stress builds doing the one minute Meditation and then continuing to repeat a calming slogan over and over in your head blocks negative self-talk. Some sing a song, others pray. Tip three: Relax your face. A relaxed face, what EFTI calls Soft Face involves keeping your jaw relaxed, your teeth unclenched, your lips almost smiling, your eyes wide, your eyebrows un-knotted, and your forehead smooth. Practice in front of a mirror. Then when tensions mount, consciously make Soft Face. You will be surprized to find anger and stress leaving you. Parenting as always been hard work and today’s parents are further burdened by the emphasis on happiness. 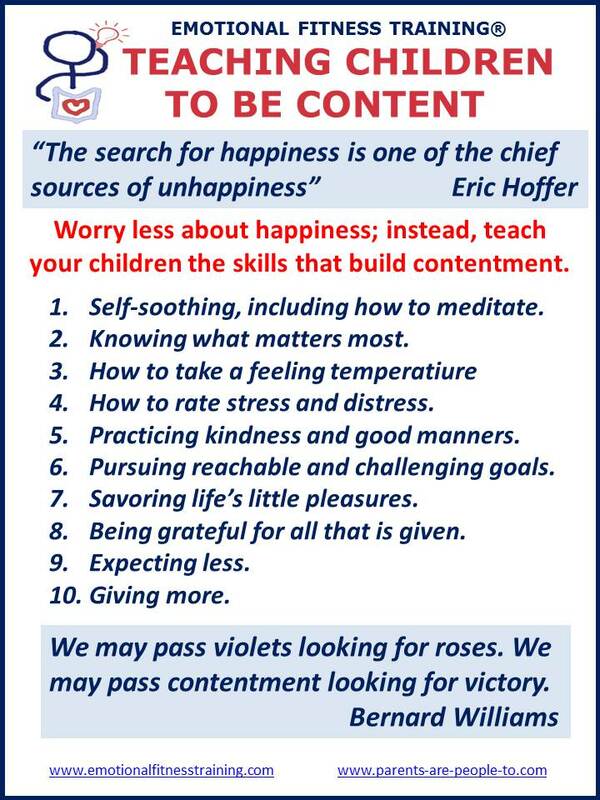 Happiness is a by-product and much less ours to control; contentment, however is within each person’s reach. If you have done the best you could, enjoyed what you could, been kind to all you meet and grateful for what has been granted you contentment should blossom. Sharing is caring, so if you found this post useful, please share it with another. For all you do, thank you. This entry was posted in Parenting Issues, Take a Break Time and tagged Emotional fitness, Emotional Fitness Training, emotional intelligence, Katherine Gordy Levine, Parenting advice, parents, postaday. Bookmark the permalink. Reblogged this on My Spot.